SGHS senior Garrett Saunders (4) attempts to pass during the Rebels 70-68 victory over Symmes Valley on Friday night in Mercerville, Ohio. MERCERVILLE, Ohio — Off on the right foot. The South Gallia boys basketball team held a 10-point advantage entering the final quarter of Friday night’s season-opening contest in Gallia County, but visiting Symmes Valley rallied to narrow the margin to two points, as the Rebels edged past the Vikings for a 70-68 victory. SGHS (1-0) took its first lead of the game, at 3-2, with 6:28 remaining in the first quarter. From there, the Red and Gold built a 14-11 advantage, before SVHS (0-1) utilized a 6-3 scoring run to tie the contest at 17-all entering the second quarter. South Gallia began the second period with a 12-1 run to widen its margin to 29-18 with 5:06 left until intermission. The Vikings, however, outscored the hosts 10-4 the rest of the way, to close the deficit to 33-32 at halftime. The Rebels shot 9-of-20 from the field and 3-of-3 from the charity stripe to extend their lead to 55-45 entering the finale. Symmes Valley, however, manufactured a 16-10 scoring run to narrow the margin to 65-61 with 0:59 remaining in the contest. South Gallia, however, closed out the game going 5-of-8 from the charity stripe to claim a a 70-68 win. Following the contest, second-year SGHS head coach Kent Wolfe was pleased with his team’s performance. “The were resilient,” Wolfe said. 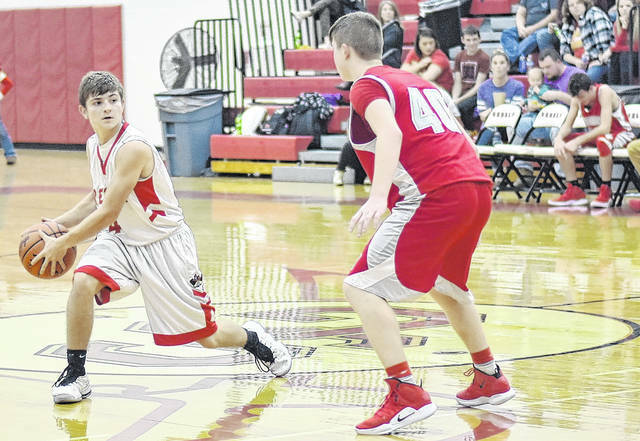 “We were up by double-digits and Symmes Valley really fought back. The did it through rebounding. We were really were fortunate because they got 20 offensive rebounds. This is the first time in years we’ve started the season 1-0. I’m really happy. South Gallia senior Nick Hicks led the hosts with 19 points, including three trifectas and a 4-of-6 performance from the charity stripe. Braxton Hardy was next for the Rebels with 18 markers, including a 4-of-5 effort from the free throw line. Joining the pair in double figures was Eli Ellis with 16 points, including a two trifectas and a perfect 6-of-6 effort from the charity stripe. Garrett Saunders added seven points, including one three-pointer, while C.J. Mayse followed with five markers, including one trifecta. Kyle Northup was net with one trifecta, as Bryce Nolan concluded the scoring totals for SGHS with two points. Jack Leith led the Vikings with 30 points, as Luke Leith was next with 14 points. Drew Scherol added 10 markers, including two trifectas, while Trenton Turner followed with six points. Alex Carpenter finished with three markers, while Caden Brammer and Toby Smather each finished with two points apiece, respectively. Justin White rounded out the scoring for Symmes Valley with one point. The Rebels finished with 24-of-58 (41.3 percent) shooting performance from the field, including 8-of-25 (32 percent) from three-point range. In contrast, the SVHS shot 26-of-59 (44 percent) overall, including 3-of-14 (21.4 percent)from long distance. From the free throw line, Symmes Valley was 13-of-29 (44.8 percent), while the hosts were 14-of-19 (73.6 percent). Up next for the Rebels, a home date with TVC Hocking Division foe Miller on Friday.